Being a quality-centric firm, we are engaged in offering highly efficient Semi Automatic Shrink Wrapping Machine that is able to work in adverse working conditions. It is used for wrapping purposes and available in various technical specifications as per the diverse needs of the clients. 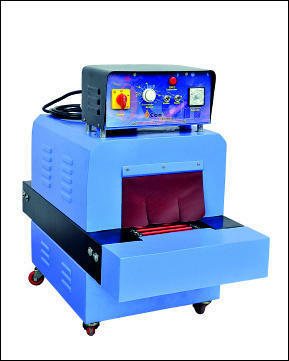 The provided machine is manufactured by our professionals using optimum quality components and advanced technology. Our offered machine can be purchased from us pocket-friendly costs. Established in the year 1995, we “Icon Industries”, are a leading Manufacturer, Exporter and Supplier of a superior quality range Pouch Packing Machine, Sealing Machine, Vacuum Packing Machine, Box Strapping Machine, Band Sealer Machine, Wrapping Machine, etc. These machines are manufactured using superior quality components with the help of advanced technology under the strict vigilance of skilled team of technocrats. The offered machines are broadly renowned for robust construction, longer service life, low maintenance, energy efficiency, optimum performance and easy operation. These machines are available in varied technical specifications to meet wide needs of our esteemed clients within promised time frame. We are providing our products under own brand name Icon.